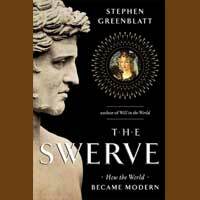 Next up in the Webster University Book Club repertoire is The Swerve: How the World Became Modern by Stephen Greenblatt. The Swerve tells the story of the fifteenth-century discovery of a long-neglected manuscript, the last copy of Lucretius’s On the Nature of Things. We will discuss The Swerve on Nov. 16 at noon in the Library Conference Room. Everyone is welcome. Additionally, the First Year Seminar, Beginning to Commence, class is reading the book now, and have been invited to join the discussion.